Every day is Halloween according to amusing infographic, The United States of Scary Things. Between the devastating effects of Mother Nature, zombies, and serial killers, American citizens have a lot to worry about year-round. If the zombie apocalypse ever truly breaks out, it looks like the east coast is totally screwed. Meanwhile, falling rocks, tornadoes, and ghosts will plague the central portions of the state. We wonder if Wisconsin should share calamities with Ohio since Dahmer was born in the Buckeye state, but killed his victims almost entirely in Wisconsin. Hit the jump to check out the infograph in full, and debate your home state’s misfortune. 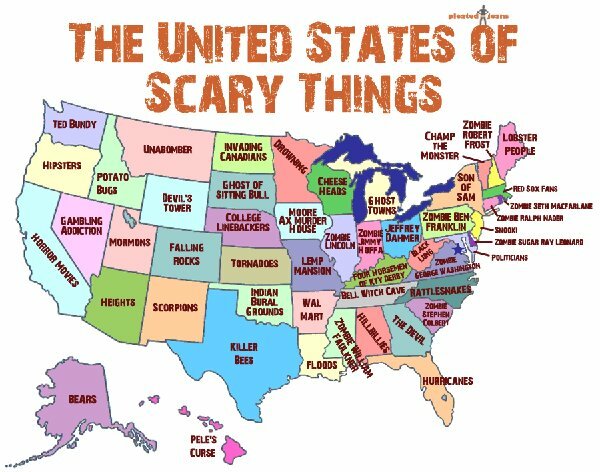 via Flavorwire » Awesome Infographic: The United States of Scary Things.